Sleep in, wear jeans, and grab your coffee at the door! As you arrive at AMC Theaters in Webster, you’ll see our signs out by the road. 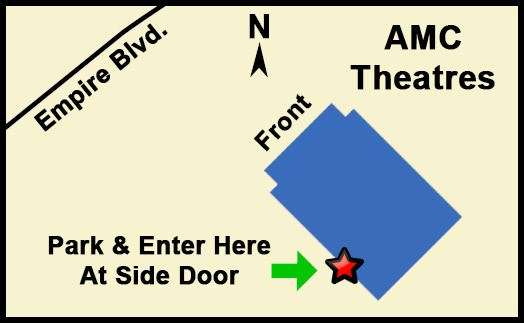 We have a separate church entrance on the west side of AMC Theaters. Follow our bright yellow signs to the church entrance. We guarantee you won’t have any trouble finding a parking space. Our greeters will welcome you on your way in. No, you don’t have to pay to come to church! Blessed Hope meets in theater #12 (newly renovated!). Once inside AMC, you'll see our refreshment table. Grab a free cup of delicious coffee and a continental breakfast on your way in (you can bring drinks and food in the theater with you). You’ll meet some sincere and down-to-earth people who are genuinely glad you came and you'll probably see many other first time visitor as well. Our Sunday services begin at 9:30am & 10:45am. During our service, you’ll hear some energetic live music led by our worship band. You’ll see drums, electric guitars, keyboards, etc. The lyrics to all of our worship songs are up on the big screen in case you want to sing along. There is a twenty minute Coffee time for both services in between. Children's ministry is only be offered during the 10:45am service (but may be offered at the 9:30 service in the future). The 10:45 service is be slightly longer and features additional music. After a few songs, we have an engaging 3-4 minute movie clip on the big screen related to the topic in sermon. Pastor Lin or Pastor John will share a biblically-centered message that will encourage, comfort and challenge people to grow in their faith and find guidance and help for everyday living. Our messages are lively, engaging, and definitely not boring. All of our messages are live! Even though we are "church at the movies," the messages aren't just on the screen. After the message, our band will do another song, followed by an offering (taken in popcorn buckets). Then the band closes with a final energetic song. All throughout the service, we have a prayer team in the back corner praying for our worship time. They are available to pray with anyone in need of prayer during or after the service. We believe you’ll find our services comfortable and relaxed. We look forward to seeing you soon!